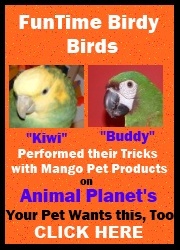 Your bird will love to climb aboard his own starship! Is Captain Kirk aboard or is it an alien invader? Only your bird will be able to find out. Bird toy contains small plastic chains, butterfly, heart and star pony beads, wooden ABC blocks and one small molecule. Toy measures 9 1/2" long from top of pear link to bottom of chain and 3" wide.